Fundraiser by Scott Blackburn : Family assistance. Wife in hospital for 30+ days. Had septic shock, complications include amputation. We are from marion and travel or stay in ft wayne. Don't really have a goal. Lisa is home now, adjusting and healing. We thank you all for the support. We've had to make many adjustments at home and still more to renovate. Please help us finish out this campaign. Any help is greatly appreciated. Hello there as you all know my mother has faced an unexpected tragic event. They are going to release her next week to come home. Thank God. With my step father being out of work and my mom no longer being able to work funds are low. In order for her to come home we must do some home construction. 4 doors ways need to be widened, a new front door must be installed, the bathroom needs remodeled so that she may be able to get into a shower and things, plus hardwood floors have to be put down for her wheel chair. My step father has not been working due to the fact he has been beside my mother through this whole ordeal. We are trying to gather what we can to make this happen. Along with this she will need several things for her personal care as well as her mobility around the home. If anyone can help this would be so greatly appreciated. With her getting her arms and legs amputated she will be getting prosthetic but until those can be had she needs home accommodations that we must build or buy. Thank you all that have given. She is a trouper and I want her home as well as the rest of my family. Thank you if you can help, and if you cant prayers would be great as well. She still has a long road of recovery ahead of her. This is my mother. She is 53 years young. 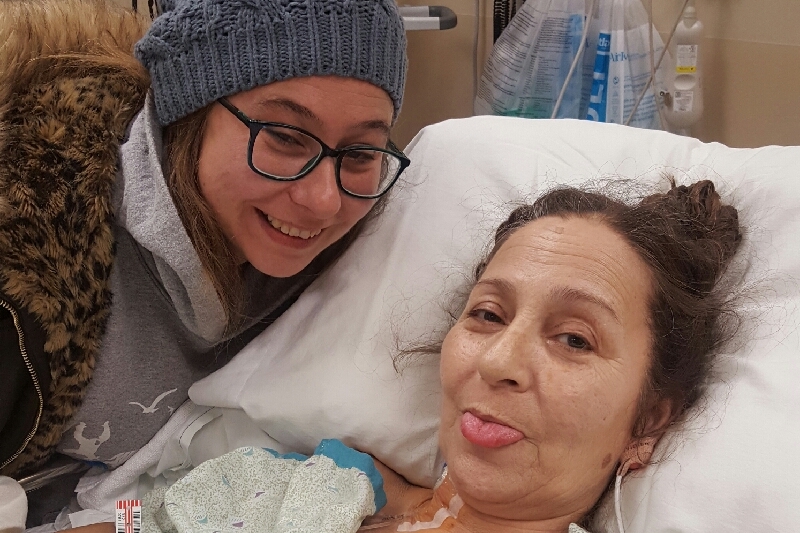 She was diagnosed with septic shock on the evening of Jan. 13th, 2019. She had previously had a cold 2 weeks before and had gotten over it. She woke up Sunday morning with an upset stomach. By 4 pm I arrived at my mothers home to take her to the hospital, and she had a fever of 105 and was delirious and didn't know what was going on. At this point we all became very scared and worried. I drove her to the local hospital immediately. No one there could tell us what was wrong with her. Her blood pressure began to dip very low so she had to be sedated and placed on a ventilator, and testing began. They continued to inform the family that she would need to be transferred because they did;t have the information or skills to deal with what she was going through. She was taken by ambulance to Lutheran Hospital in Fort Wayne, IN. After a couple days they found her positive for streptococcal pneumonia bacteria which was infecting her blood.She also tested positive for meningitis but it never activated. She remained in ICU for 2 wks where they helped her recovery from the infection with several antibiotics, several suppressors, and anti-fungal medicines. The doctors let us know daily (she had a collection of them at this point) that she was still very ill and she had a long road if she would make it . During this time my family had stayed in hotels spending what money we had to be as close to my mother as we could possibly be. After this she was moved around to 3 separate places in the hospital. We drive here everyday from an hour away and take shifts with her. This is due to the amount of suppressors she was on during the first couple weeks. This medication kept her organs safe, but cut off blood flow to her extremities.This caused her tissue extreme damage in her hands feet and parts of her legs and arms causing her to not being able to use them. This produced extreme blistering everywhere as well as water retention in her extremities. She has just completed her second surgery today. She has had amputations of both arms to below the elbow as well as both legs below the knee. She will continue in recovery for a few days before they move her to rehab. Here she will be helped with learning how to use her limbs again as well as being set up with prosthetics. Also she will have home care as well as we have to rebuild some of the things in the home so she can manage her life better. This has been a long road for all of us, 36 days and counting to be exact. We are going to make sure to keep infections at bay and be hopeful for full recovery with the addition of prostetics. Any help that can be given is greatly appreciated. Prayers are appreciated. She is in a great mindset and is determined to get back to playing with her grandbabies and mushroom hunting in the near future. Septic shock is no joke, and people should educate more about the number one killer. Your life can be transformed or taken in a matter of hours.